That Franz Josef Schorn (a guy from Düsseldorf) and Hubi Scheid (a guy from Trier) have great ideas when it comes to culinary things isn’t a secret. One of those ideas were to explore the wine region of Beaujolais and it’s red grape of Gamay. Thats what we did! To be honest, everyone has his favorite regions and grapes, which one is consuming more often than others. Beaujolais with its Gamay based reds isn’t one of this favorite grapes in general – unfortunately. But why? Maybe this bad image comes from the fact that the wines of Beaujolais are youngsters all the time. Every year on the 3rd Thursday of November, just a few months after harvest, the new vintage is released as the Beaujolais Noveau. Maybe thats the reason why the wines of Beaujolais are often associated with lower quality and potential than most reds from the surrounding regions. The region of Beaujolais is located in the south of Burgundy, of course it’s France, and belongs to Burgundy geographically. Because the wines and their style differ from the Burgundy stuff, the region is independent from its neighbor in the north. It’s divided into three subregions: Beaujolais AOP, which makes the major part of Beaujolais, 38 vineyards classified as Beaujolais-Villages and finally 10 Crus(north to south): Saint-Amour, Juliénas, Chénas, Moulin-á-Vent, Fleurie, Chiroubles, Morgon, Régnié, Côte de Brouilly and Bouilly. The absolutely dominating grape in Beaujolais is Gamay. A robust and early starting grape, which is in terms of its genealogy and taste deeply connected with the wines from Burgundy. The source of Gamay is located in Burgundy, is a crossing of Pinot Noir and Heunisch and makes the redwines a very light type of red. The aromatics of Gamay are mainly based on fruit and can be very complex, even some guys say its a simple and one-dimensional type of wine. The color is really light, the nose is dominated by aromas of raspberry, cheery and banana. Then it gets more complex: floral, earthy notes, forest floor, smoke, vanille and mushrooms come to your mind. You often will find those animalistic notes, too. On the palate the wines are driven by freshness, a low level of tannins and a vivid acidity, which often creates an impressive glou glou. You will empty the bottle in minutes! Serve it a bit chilled and it will be your favorite red during summer time. Gamay – how about the quality? As mentioned before, they have a problem with their outward appearance. Just 2 months after harvest they are sold on the world wide markets as Beaujolais Primeur or Noveau, which is a main factor for it’s bad reputation. But, how about the quality of these light reds?! A short story to this: Some months ago I was in the UK and had a stunning 2016 Morgon by Marcel Lapierre for just 38€ (!!!) in a restaurant – it was also served by the glass. The bottle was drunk with 2 guys in total and finished in a crazy speed, that impressive was it’s glou glou. I am still fascinated by this wine. Responding to my facebook post, which says „what a crazy good stuff“, some kind of discussion started, which was about the potential and quality of the wines from Beaujolais. 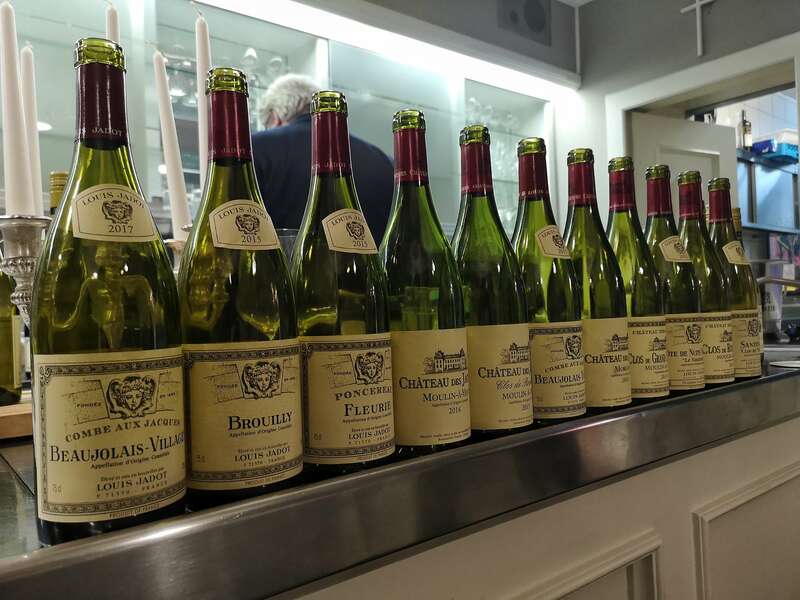 Some said that wines from Beaujolais are not made to age in the bottle and should be drunk quite young – thats what a lot of distributors tell, too. „Drink in 1,2,3 years.“ In addition to that: the wines from Beaujolais are not that bigtime stuff as the wines from Bordeaux and Burgundy. But: do they need to like that?! These wines are independent and individual and a super exciting Ergänzung to your wine cellar. Now finally back to why I had the idea to write something about Gamay. On a perfect tasting saturday some wine lovers met in Düsseldorf to taste a range of Beaujolais wines. We enjoyed a delicious six course menu with different wines from Louis Jadot. The range of wines reached from the entry level Beaujolais-Villages up to the different Crus. We had Brouilly, we had Fleurie, we had Morgon and we had Moulin-á-Vent. The presented wines were from the vintages 2010 to 2015, in perfect shape, even though some of them should be „outside the recommended drinking window“. To make it short: none of these wines were done, tired or just too old. The group of tasters was very mixed and all them confirmed that Gamay isn’t the typical red they have every day or week. But especially the freshness, lightness and its special aromatics gefiel sehr gut. Domaine de Pincereau Fleurie 2015 very fresh, round and female. Fruit sweetness, cherry, violets and well-wrapped wood. Peppery accompanied, clear and extremely accessible. Stately finish with cherry and some pepper. ‘This guys has some potential”, was the tenor of the group. Chateau des Jaques Moulin-a-Vént 2014 followed with a contrast. It was much lush and dense, both in the nose as well as on the palate. Dark berries, sour cherry, wood finely wrapped. Then there was earth and smoke. Very silky on the palate, pleasant sweetness, slightly spicy and accompanied of lively acidity. the most mature wine of the tasting. And then again the question came up: how far is this Gamay? 8 years old and it was in a great shape. Fine wood flavors, toast, then came the fruit. Plum, sour cherry and cranberry. After that, good oiled leather, mushrooms and a little horse stable – I like that very much up to one conscience grade. Here wonderfully dosed. He developed in the glass fast, from the woody to the fruitier side. Was then very round and harmonious, with good draft, polished tannins and animating acidity. Showed a decent length, finished peppery and with juicy cherry. After this rehearsal I’ve decided – Franz-Josef way too – to try more Gamay, very purposefully. These wines are anything but one-dimensional and banal and on top of that they are just delicious. For me, the drinking flow of a wine is very important, because bulky drops are exciting, but also more exhausting. With such a Fleurie or Morgon, you can enjoy the claim, have fun in the glass and if you look at the topic of value for money, the fun is even greater.